The true story of Boston Marathon bombing survivor Jeff Bauman. In his new feature, Stronger, David Gordon Green tackles the real-life story of Jeff Bauman, a Boston man who was a victim of the 2013 Boston Marathon bombing. We first meet Jeff (Jake Gyllenhaal), charming his way out of an awkward situation at his job at Costco so he can leave early, nab his ‘lucky chair’ at the local bar, and watch the Red Sox game. There he meets up with his rambunctious, hard-drinking family. Enter long-suffering ex-girlfriend Erin (Tatiana Maslany), who happens to have come by the bar to collect sponsorship money, as she is running in the Boston Marathon the next day. Hoping to win her back and make up for his chronic unreliability, Jeff vows to be at the finishing line to greet her, holding up a home-made placard so that she can easily see him. Unfortunately, the one time that Jeff manages to show up, a pair of terrorists also show up, and leave behind two explosive devices filled with nails, glass and ball-bearings. Jeff is at ground zero when the bombs detonate, and he loses both of his lower legs in the explosion. Soon after regaining consciousness in the hospital, and although still traumatised, Jeff is able to help the home security and law enforcement authorities identify one of the suspects. Not only is he a survivor, but he helps to track down the enemy, so he becomes a big story in the papers and is touted as a symbol of strength and hope for a city in need of a hero. However, Jeff doesn’t feel like much of a hero, and his own battle through physical and emotional rehabilitation is a long, painful and arduous journey. The movie doesn’t pull any punches when it comes to outlining just how distressing the reality of his situation is - he screams in agonised pain when his dressings are changed, holding on to Erin as if she were his only lifeline. We see the awkwardness of coping with everyday life in a wheelchair and without legs - even the simple tasks of dealing with stairs and tiny toilets require several people and a huge effort. His mother (played by Miranda Richardson) takes every opportunity and accepts every request for a public appearance in order to parade him as a local hero - the face of ‘Boston Strong’. She does not mean to exploit him, although the family does enjoy the perks that come with his public exposure, but she is insensitive to his mental state, and in his turn, Jeff is unwilling to disappoint her and his relations by revealing his depression. Jeff does not feel ‘awesome’, and soon the strain begins to show, fracturing his new-found relationship with Erin, who has gone to great lengths to support and care for him - moving into the tiny apartment that he shares with his mother, quitting her job, and tolerating the fact that she is the only one who is organised enough to deal with Jeff’s needs with any efficiency. She becomes frustrated as Jeff reverts to his old ways - his unreliability, his drinking and his lack of courage as regards being honest with his family. Finally, after he fails her in a crucial moment, she too cracks under the strain. Stronger never shies away from its realistic portrayal of trauma and the drawbacks of coping with a well-meaning, but erratic, inefficient and alcohol-drenched family. This aspect is sometimes played perhaps a little too broadly by what is really a sterling cast. The film however transcends the regular run of inspirational dramas because it doesn’t idealise its central character, nor his struggles - Jeff has faults, plenty of them, and so does his family. The two most heroic figures come in the shape of kind-hearted but feisty girlfriend Erin, and Carlos. Carlos (Carlos Sanz) is the man who, on the day of the bombing, ran towards the site of the explosions in order to help the wounded victims. He saved Jeff’s life, but Jeff is initially reluctant to meet or talk with him. When things hit rock bottom, Jeff relents, and then Carlos saves his life a second time, this time by helping him find a way out of his deep pit of self-pity. Moved by Carlos’s words, Jeff begins to make some changes in his own life. He must learn how to survive as a person, not just a symbol. Having neglected his physical rehabilitation appointments, he resolves to learn to walk again with prosthetic legs, and then he, in turn, encourages strangers who recognise him from news coverage, to talk about their own traumas, helping them to cope with their own loss and grief. 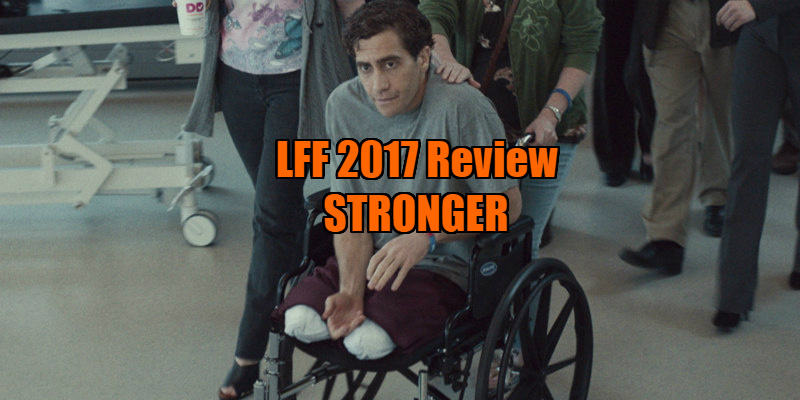 Stronger is buoyed by the calibre of its performances, particularly the central ones by Gyllenhaal, Maslany and Richardson. During much of the story, Jeff is told that he’s a hero but he, and the audience, are forced to question just what that means. What value does the commodification of tragedy have in society and what is the way that we can most compassionately treat its survivors? 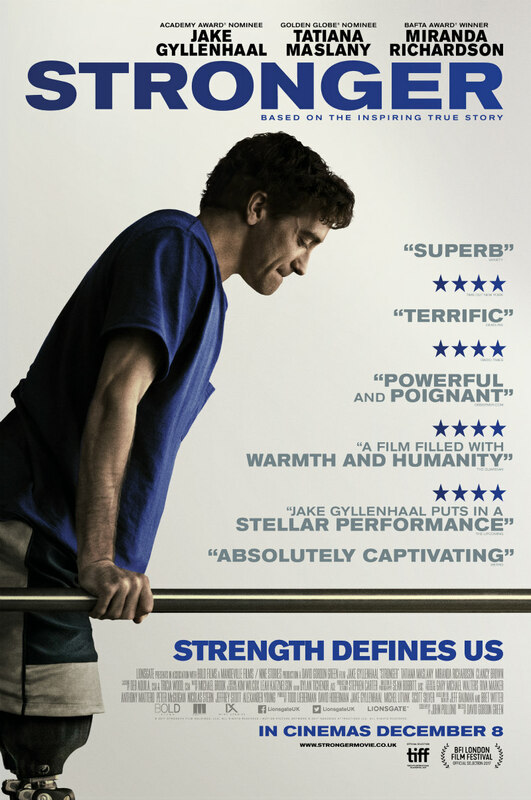 Stronger is in UK/ROI cinemas December 8th.